After visiting Havana, Cienfuegos and El Nicho, the last stop on our tour through Cuba was Valle de Vinales. 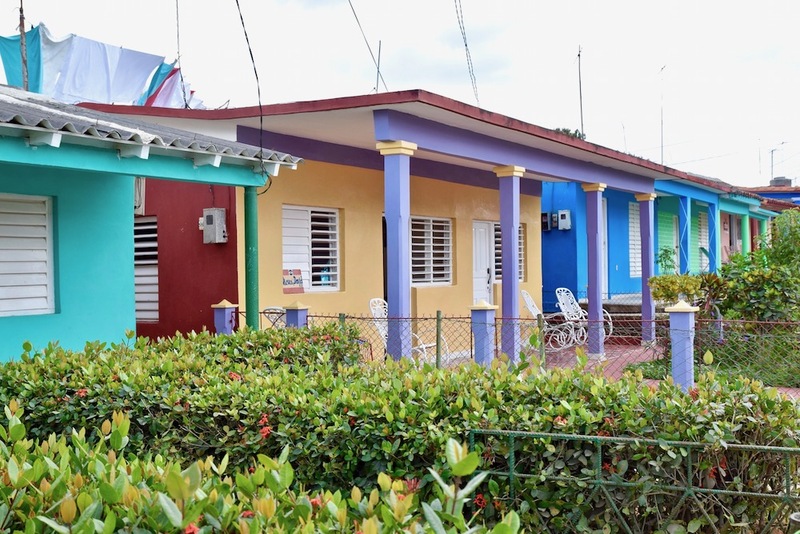 Vinales is about 3 hours west of Havana, and worth an overnight stay, though many make it a whirlwind day trip from Havana. We actually spent 2 nights there and it ended up being one of my favorite stops of the trip. 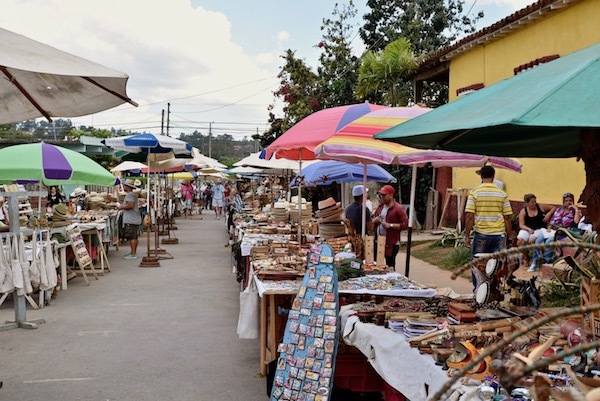 The small town of Vinales encapsulated a lot of what we experienced on our trip through Cuba. 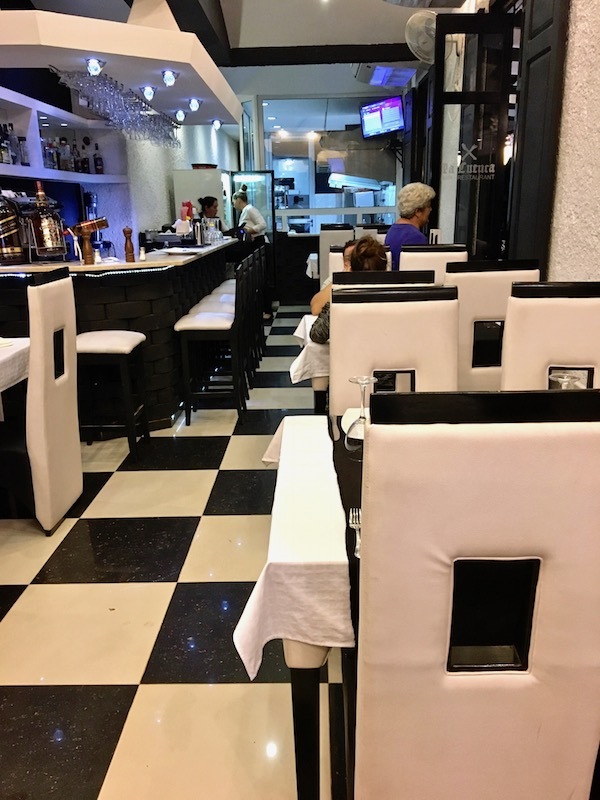 It had a nice little nightlife and selection of restaurants like Havana, mixed with traces of tranquility from Cienfuegos and the greenery of El Nicho. Then there were the colors. 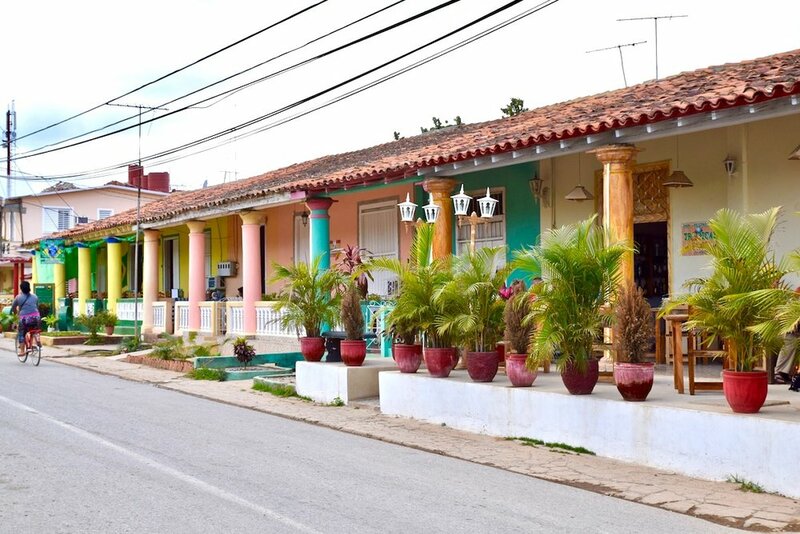 I never tired of the bright, beautiful pastel shades of Cuba. Vinales is where I learned the word mogotes, and also got to see them first hand. 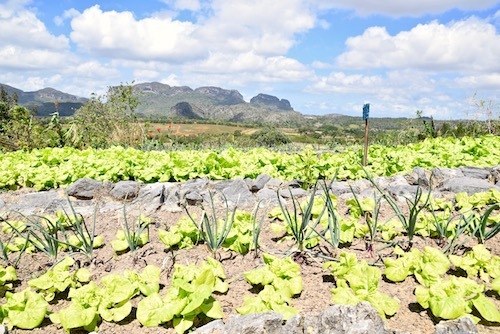 About 160 million years ago, limestone and other rock formations rose from the sea, and what's now left are jagged outcrops and fertile red soil, perfect for growing tobacco. 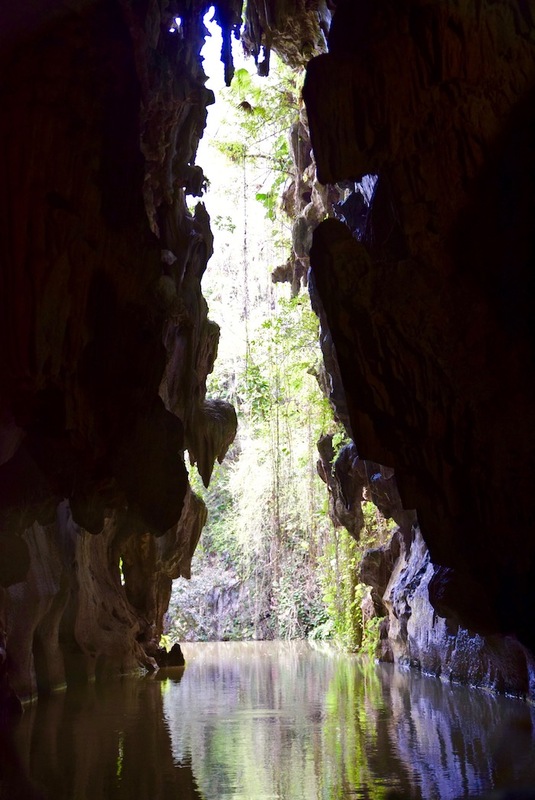 We took a private day tour with an adorable young gal and driver to explore Valle de Vinales. Our first stop was at Cueva del Indio, one of the caves in Vinales. 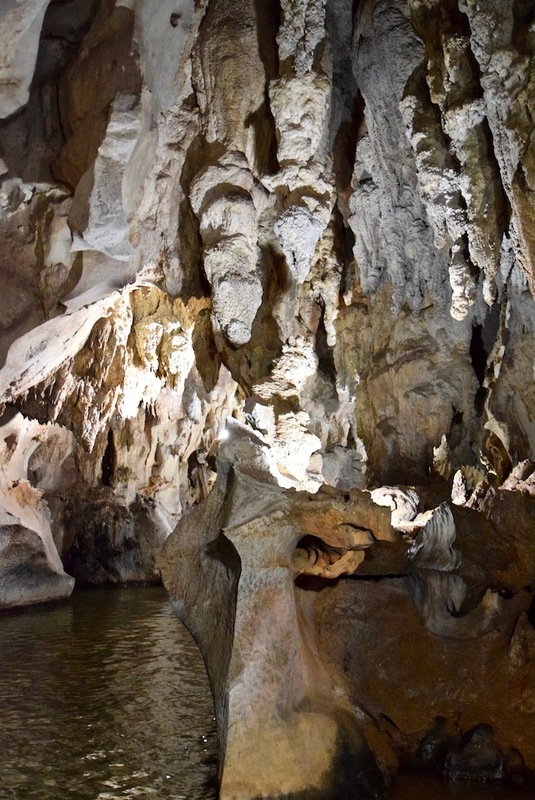 Native Indians built their homes in these caves and now they're open to the public to admire the limestone formations and stalagmites. We were also able to board a boat for a short ride through the cave to see if we could pick out the crocodile or champagne bottle rock formations. Some were easier than other's, but it's worth a visit. 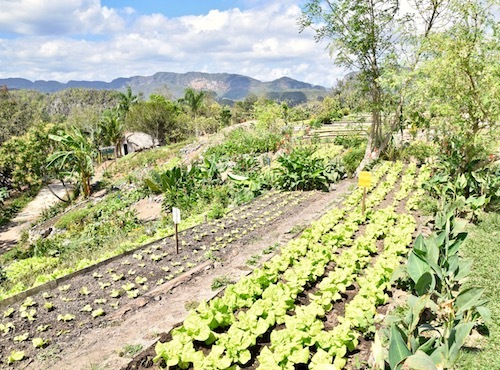 While the name of this botanical garden in Vinales may not roll off your tongue, it is a sweet little 100 year old oasis worth a wander. 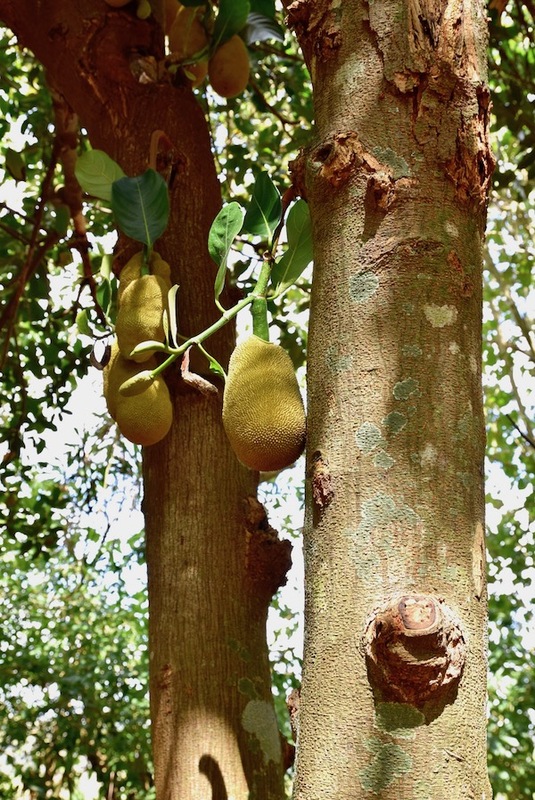 There's over 190 species of plants and you'll likely have a friendly and knowledgeable guide to walk you through and point out some of the noteable plants and trees like the jackfruit tree. Our guide couldn't believe vegans try to pass off jackfruit as meat. Oh, it's coming for you Cuba! 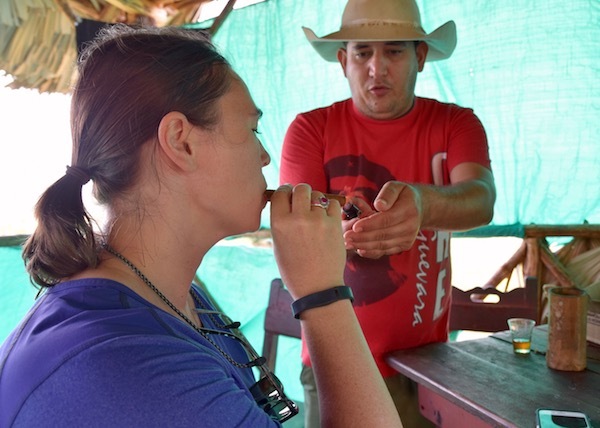 One of the main reasons people come to Vinales is to see how tobacco is grown and processed into cigars. We were able to visit a private plantation where a family had been given land by the government to grow tobacco. 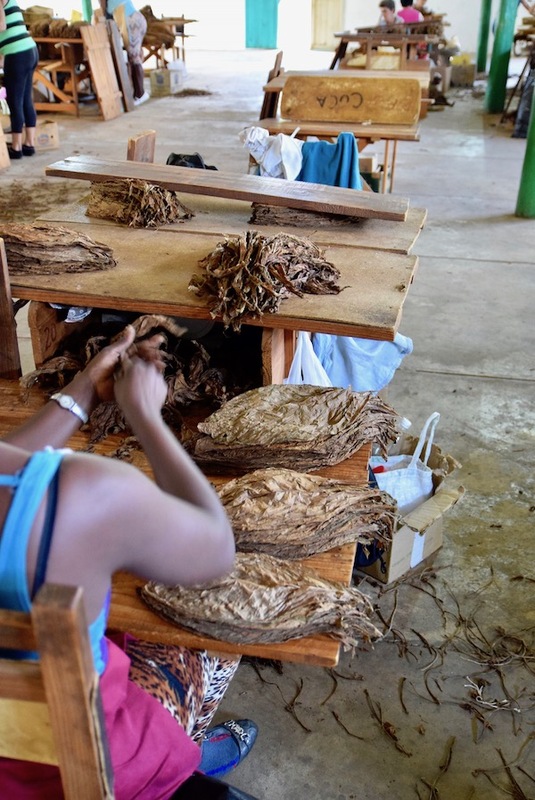 They must give 90% of their harvested tobacco leaves to the government, but then they're able to keep the last 10% to make their own cigars. We also visited a government run tobacco plant. 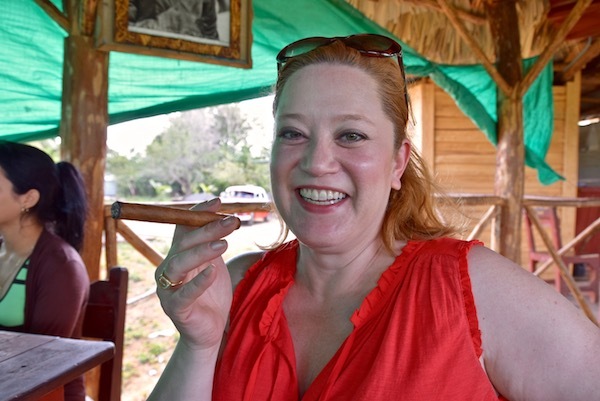 They receive the leaves from these farms and then processes them into cigars. Mostly women were working there, sorting leaves by sizes at break neck speed. There was nothing left to do after all that cigar education, but have a smoke ourselves. I like how they'll sweeten the taste with a dip into honey before smoking. It made it a little more palatable at 10 in the morning! On a large mogote face in Vinales is a 660' x 990' colorful mural depicting evolution. Castro ordered the mural to be painted because he thought Vinales needed a point of interest for visitors to see. It took 18 people and nearly 7 years to paint, and is indeed a good site to see! You don't need to stay at this rosy pink hotel, but you will want to take in the views from atop the hill. You get a good glimpse of the limestone mogotes from here, making for some nice pictures. 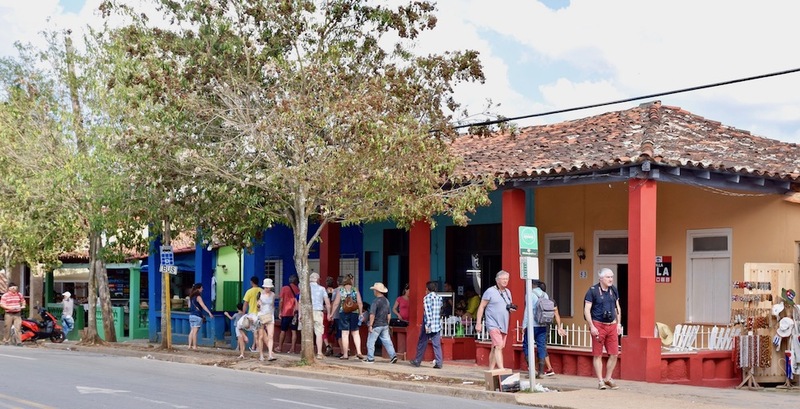 There's one main street in Vinales where you'll find wall to wall restaurants, as well as souvenir shops, selling the usual Cuba momentos. There's also an outdoor market that sets up every day on the street in front of 3Js that's worth a look. Did someone say tapas? 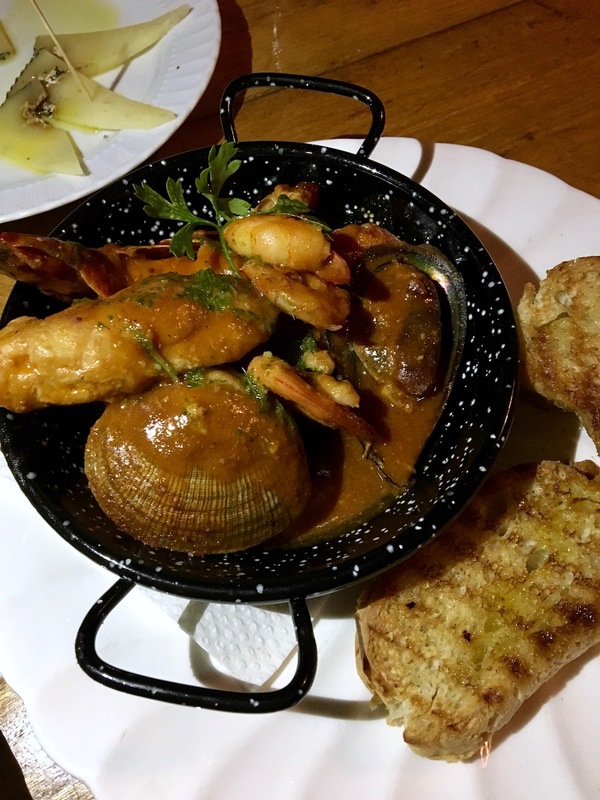 Sure, some of the typical Cuban items were disguised on smaller plates, but there were new items like patatas bravas, pasta and seafood stew. Sadly, new doesn't always mean good. The pasta was gummy and thick while the seafood had a smell that left me to focus solely on the potatoes. El Bily is a nice little casual cafe for some basic food like roast chicken or a sandwich. They also have wifi so it's a good check-in spot for lunch. Paladar La Cuenca ended up being a sleeper hit. The modern black and white checkered interior drew us in, but the wrap around patio sold us. The menu had things like rabbit mole and roast lamb - both of which were quite enjoyable, but maybe my standards had dropped to sub-par levels at this point. 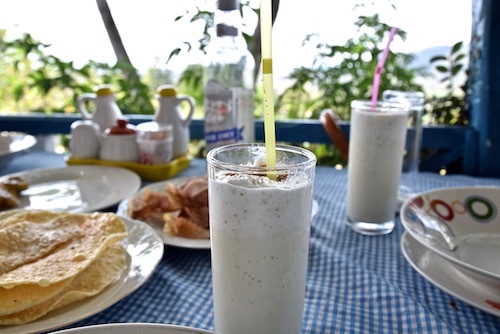 My favorite restaurant in Cuba was actually my last, and not just because I knew I was going home. Finca Agroecologica was the food experience I was looking for as they grow all of their own food steps away in their garden. AND, they have more than onions and peppers for vegetables. It was almost, no it was, quite literally too much. 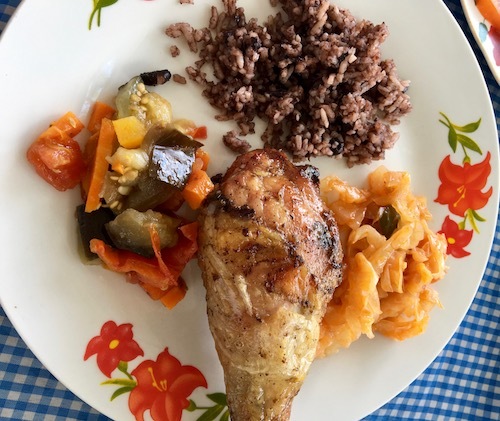 I wish I could have had a plate of each dish from Finca Agroecologica every day while I was in Cuba. There was tarot, yuca, tuna, vegetable soup, chicken, pork, fish, cabbage, pickled okra - yes pickled okra! My love for the restaurant had nothing to do with the welcome cocktail we received, though it did get me started on the right foot. It's called the Anti-Stress drink and it has honey, coconut, pineapple, coconut milk, anise, basil, lemongrass, cinnamon and mint. Yes, I will be trying to recreate that cocktail soon. There's also a rum bottle that they hand you to pour your own. It's dangerously delicious. 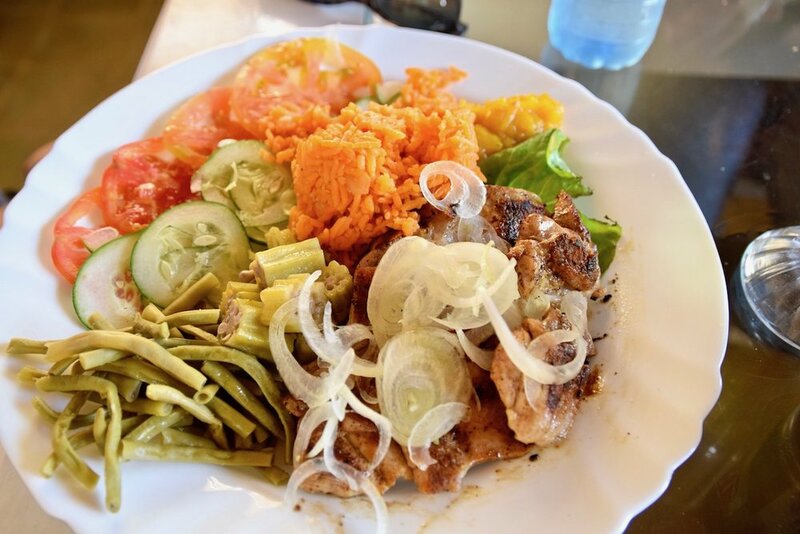 I was happy to have found a variety of farm fresh food before leaving Cuba. Regardless, we truly enjoyed our time in Cuba. Cuba is still a rather untouched area to visit and that always holds an appeal to see something before it's tarnished. I'm going to hope that Cubans find a way to hold on to their culture and community as the tourists continue to fill their country. Go see Cuba now, or read about the rest of my trip from the quiet of your own home.